In Southern Province’s new provincial capital, Choma, are hidden artistic treasures whose value may probably not be appreciated as much as it should be by its custodians as well as people who have come in contact with it over the years. 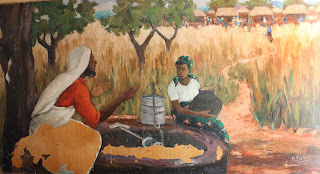 Familiar, and accessible mostly to pupils that were educated at Njase Girls Secondary School, among them tourism and arts minister Sylvia Masebo, is a chapel that is decorated with life-sized wall paintings by late Zambian muralist and Christian painter Emmanuel Nsama that have majestically covered both sides of the interior for the past 42 years. 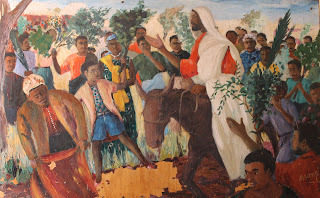 Only 29 years old at the time, Nsama was commissioned to paint eight large murals (paintings) depicting the life of Jesus Christ by a European missionary and the founder of the school which now belongs to the United Church of Zambia, just four years after the country’s independence upon returning from a two year advanced art programme at Sheridan College in Canada. As much as the murals belong to the Church and the school, the fact that the works are over 40 years old and Jesus is depicted as an African adds strength to the imagery in line with enculturation where Europeans and Africans may have found them as instruments of dialogue in a newly liberated Zambia giving the paintings a high degree of significance with regards the country’s cultural heritage. 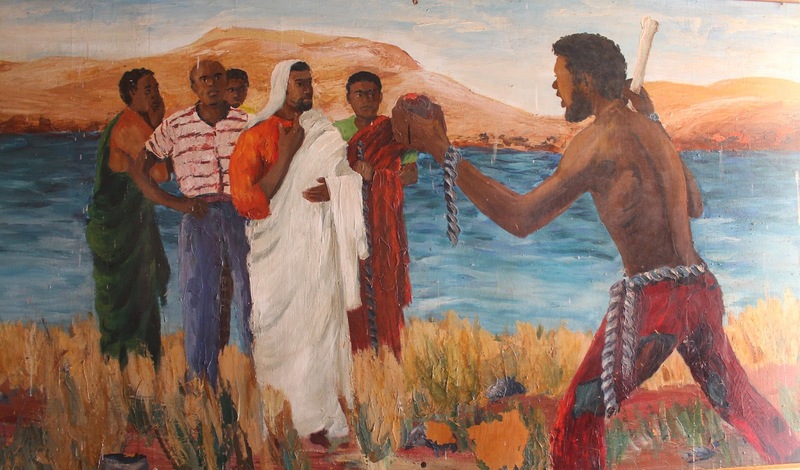 Whether or not Nsama had the autonomy to depict African bible characters, in these works, he becomes an interpreter of Christianity allowing Africans to encounter the Gospel in their own culture as they look at images, not of European iconography, but something closer to home that makes Christianity not so foreign. But in his work not only does Nsama attempt to enculture Christianity by depicting an African Jesus, he also made an attempt to bring the bible scenes to the modern-day, or the Zambia of the moment. A good example would be the proverbial scene from Mathews 21:1-11 of Jesus Christ’s triumphal entry into Jerusalem riding on a donkey to the enthusiasm of the crowds. While Nsama’s entire cast is African, Jesus is clad in a scarlet robe with a white cloth covering his head, typical of European iconography; a boy in the multitudes throwing palm leaves before Christ is dressed in modern European-style clothing and the woman next to him is dressed in chitenge fabric. In one of the paintings, the woman from whom Jesus asked a drink of water at the well while travelling through Samaria in the book of John is also clad in chitenge waist and head wrap. She holds an African clay pot and drinking gourd in her hands looking more Zambian in appearance than a Samaritan of Jesus’ time. In the backdrop is what looks like savannah grass lands and a footpath leading up to a village with thatched huts, creating an idyllic African landscape. The work is presented with earnest simplicity, but the sheer scale of the paintings that were executed on two and a half metre wide wooden panels and screwed to the walls suggest the artist had spent countless, backbreaking hours that must have given him a sense of monastic vacation to get the job done. 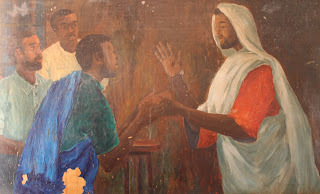 There is a downside to the revelation of these outstanding specimens of African Christian art. All the eight murals are damaged, some more than others. Most of the damage seems to have occurred at the lower points of the murals due to continuous human contact. It is clear that over the 42 year period, pupils have been rubbing against them as well as playfully peeling the paint off, which is not surprising considering the school does not offer art as an examinable subject and the children also have the misfortune of being in a country whose art appreciation, even on the highest rungs of the social and academic ladders, is all but non-existent. But the deterioration on some of the paintings is due to natural causes, such as possible leakages in the seams of the roof and the effect of direct sunlight from a broken window or two. It is also obvious that rain water seeps through forming algae on the surfaces of some of the paintings. The paintings are aching for restoration. This however should be done by engaging professionals. Nsama, like other artists of his time maintained very high professional standards which is why the work has not faded until this day. In his day, academically trained artists used pigments, turpentine and linseed oil in the classical European manner. So it would make no sense to engage the many sign writers readily available in Choma to retouch instead of restore the treasurable images. Strictly speaking, the Njase Girls chapel needs slight restoration as much as the paintings do. It would be nice to see the School and former pupils put their heads together and help raise some funds for such a project so that the building, as well as the paintings continues to be spiritually uplifting to pupils who will be passing through the school for many more years to come. Nevertheless, fate seems to be on Njase’s side. Not only is the current minister in charge of the arts one of its academic products, but the recent elevation of the town as the provincial capital further raises the schools profile and according to media reports, K3.8 billion out of the K15 billion for construction of infrastructure by the government has already been released. The town is also the home of the Choma Museum and Crafts Centre, (formerly a girls school itself) that has proved popular among local and international visitors with its permanent display of the arts, crafts and culture of the Tonga people as well as the gigantic steel balls that were used in the construction of the Kariba dam. 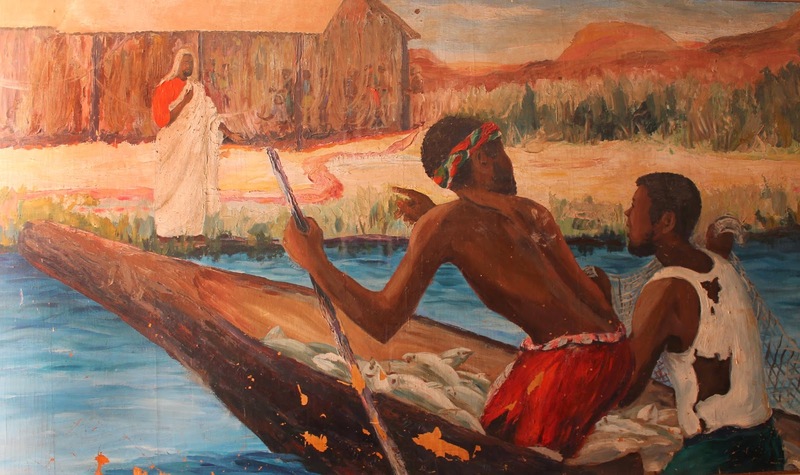 The museum has also been quite active displaying works by notable artists such as Bert Witkamp, Patrick Mweemba, Simon Chungu and Sylvia Mwando. There is no harm in wishing that the murals at Njase become an extension on the itinerary of tourists and researchers as they visit the museum just about seven minutes’ drive away. Choma is only two hours outside Livingstone and it just might benefit from visitors to the United Nations World Tourism Organisations general assembly next year, who knows. The school celebrates its golden jubilee next year. Wow! I love these paintings. I love Triumphal Entry; I'll enjoy showing this to our congregation on Palm Sunday, with the artist's name and this blogspot, of course. Thank you for sharing! 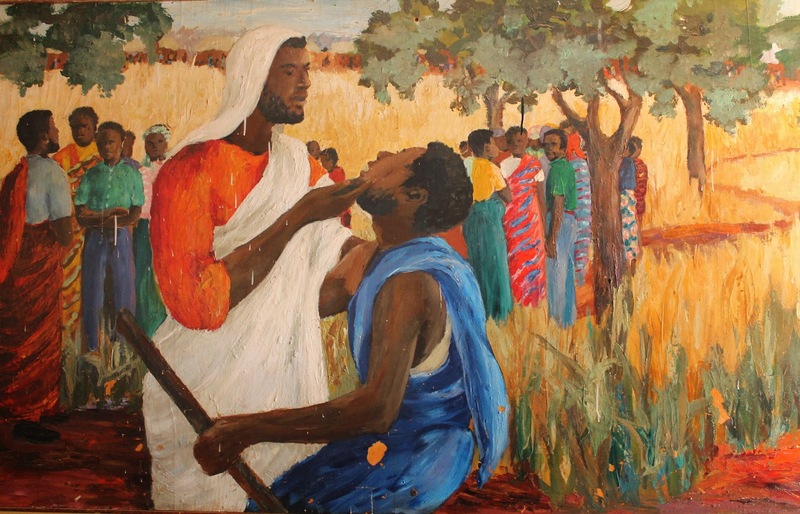 Hi Andrew, I'll ask on your Facebook page, too, but am I able to reproduce the Triumphal Entry painting on my blog for Palm Sunday? Yes, can you advise how to obtain permission to reproduce the image for worship and church website?